“Jerusalem, Jerusalem´ was the outcry of Jeremiah in his Lamentations, and of Jesus when he was rejected by the leadership in in the holy city. James Carroll’s searingly excellent book of this title is an extension of this outcry with historical, theological and spiritual depth. This book is not so much a history of Jerusalem as a history of the idea of Jerusalem, the Jerusalem of the imagination. The history of the city itself, of course is deeply affected by the ideas and imagination projected on it, almost always to its detriment. 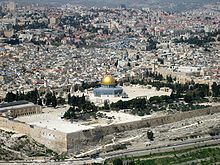 Jerusalem is an image of the ideal, the perfect city and yet this great ideal has shed more blood than could fill an ocean and at the present day the ideal threatens the survival of humanity and the planet we live on. How can this be? The Jerusalem of the imagination is narrated through the Jewish establishment of the city as the capital of Judah, a city that became loved when it was lost during the Babylonian exile. It is the city where Jesus ended his preaching ministry and died under the Roman authorities. It is the city the first Moslems wanted because of their share in the tradition of Abraham and the prophets. It is the city that swirled through the Christian imagination, spurring a virulent anti-Semitism that reached its climax in the Shoah. Jerusalem inspired the crusading ideal that lead millions of soldiers and civilians to their deaths. The Battle Hymn of the Republic powerfully sings this violent ideal of the crusade in its purple poetry and Hubert Parry’s noble hymn tune gives force to the ideal of conquering the holy city anew. It is not possible to do justice to the scope and depth of this book. Anyone interested in religious studies, theology, history, human culture and almost anything else would do well to give the reading of this book a high priority and to read it slowly, carefully and thoughtfully. I do not agree with quite every detail in Carroll’s analysis. Some of his interpretations of the New Testament seem to confuse the content with its reception history, although his analyses of the reception history is fully accurate. The overall thrust is highly compelling and will give every reader, whether Jewish, Christian, Moslem, atheist, or anything else a stiff challenge to one’s thinking, imagination, and relationship to violence, most especially supposedly “noble,” “redemptive” violence. This entry was posted in Gospel, mimetic desire, peace, René Girard, spirituality, Tools for Peace and tagged Christianity, City on the Hill, crusades, Holy City, Hubert Parry, idea of Jerusalem, Islam, James Carroll, Jersalem, Jersalem in imagination, Jerusalem, Judaism, mimetic desire, mimetic rivalry, sacred violence, violence, Wilfred Owen, William Blake by andrewmarrosb. Bookmark the permalink.